I rarely stray from my beloved L'oreal Telescopic Mascara but recently I've really wanted to try out some mascaras that help to keep a curl in. My lashes are the straightest lashes in the world, if it weren't for my trusty Shu Uemura eyelash curlers then I would be so lost. Eyelash curlers are a great way to produce the curl but I've been looking for the perfect mascara to keep the curl in throughout the day. This is where the Eyeko Black Magic Mascara steps in. I've been using this mascara for around a week testing whether it does the job, so here's the verdict. Let's start with the packaging. 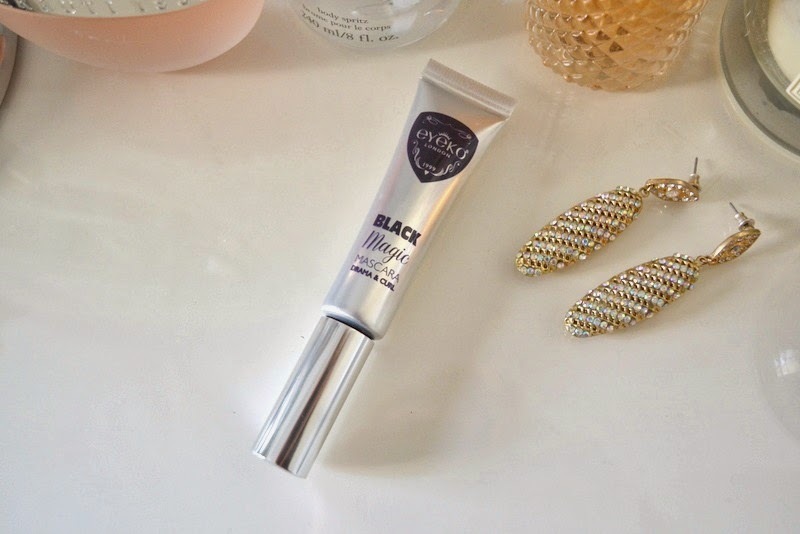 The silver tube is very different and I love how easily it squeezes into my makeup bag. I normally stick to plastic brush applicators so I was slightly wary when I saw the brush but loved the fact that it's curved. I find that it's so much easier to apply mascara with a curved brush and it avoids me poking my eyes out or getting black splodges all around my eyes. The formula is nice and dries really quickly, which means I can build up the layers easily in the mornings when I'm in a rush. It doesn't feel heavy when applied to the lashes and can be easily built up to give the desired full lash effect. It keeps my curl in reasonably well throughout the day and ensures that my lashes don't return to their straight form. It's also so easy to remove, it comes off a treat with my Clinique take the day off and doesn't leave any clumpy residue on my lashes which is a nice change as my L'Oreal one is a pain and always leaves bits of mascara behind. Overall, I really love this mascara and I will definitely be using up the rest of the tube. However, for £18 pounds it's slightly pricey and so I probably won't be re-purchasing it unless its on offer. I'm still on the hunt for the best mascara to keep a curl in so if you have any cheaper suggestions let me know! Great review! I have loved their liquid eyeliner pen for every but have always wondered about the mascara.